Halloween is inching closer and closer, are you ready? Oh, best believe that I'm ready. With 10 days to spare, y'all. Boo-yah. Get it? Boo-yah... Halloween? Anyone? Bueller? Hmm. 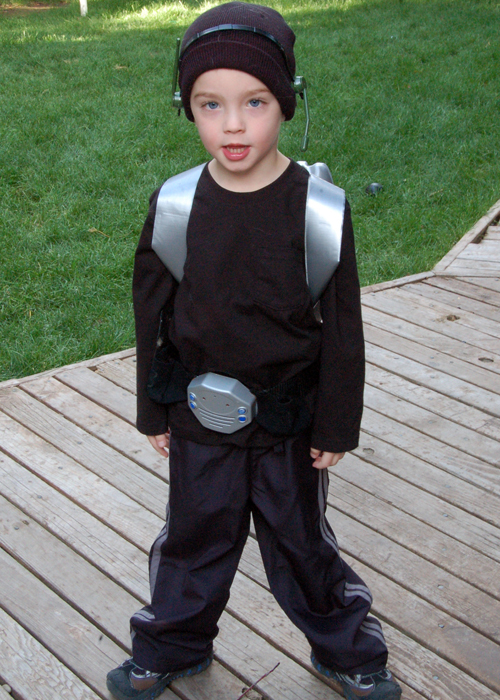 I finished Wesley's costume yesterday, and since Aidan begged me to buy his costume this year and I bought mine, too (hanging my head in shame) this mama is D-O-N-E.
Wesley wanted to be a spy (or a "super spy" as he calls it), so first I picked up inexpensive black pants, a long sleeved shirt and a beanie at thrift stores and Walmart. I also found a little set of spy tools at the dollar store (masquerading as a soldier costume tool kit). 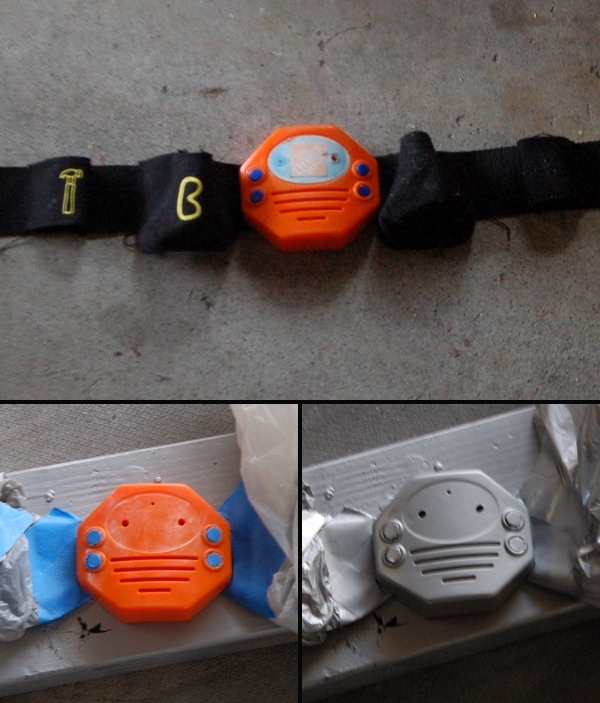 I attacked my boys' talking tool belt from a Home Depot gift set with some Goo Gone to remove the sticker and yellow tool emblems from the pockets, then spray painted the main box a silvery spy color. 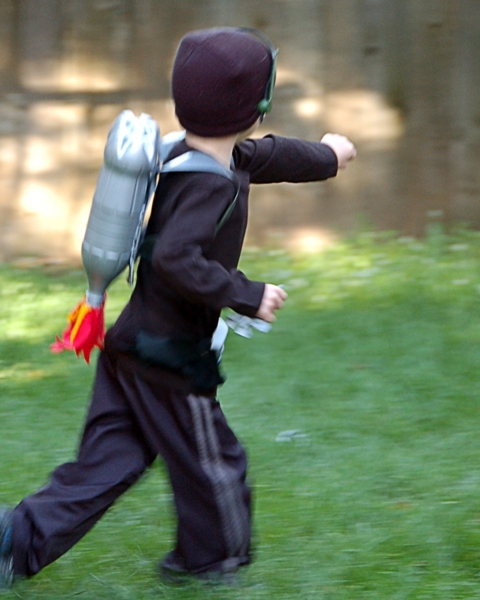 Next I made him a jetpack like the one I talked about earlier this month. I found two smaller bottles of soda (1.25 liters) that I thought would fit his small frame a bit better (and be less noticeable, because hellooooo, he's a spy!). I glued them to a scrap of cardboard and to each other with a glue gun and spray painted the entire thing with a brushed nickel paint. 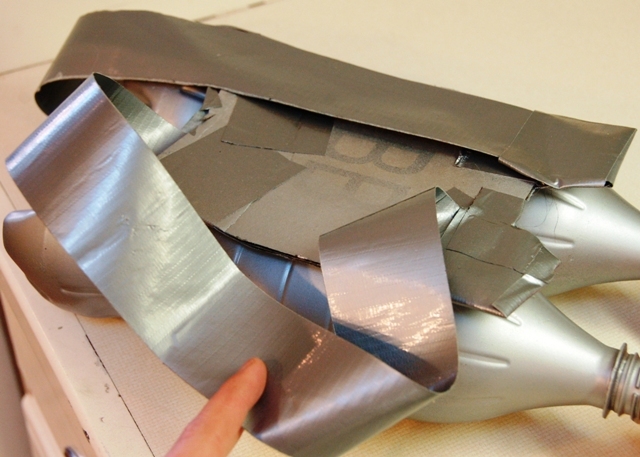 Next I doubled duct tape onto itself to make silver jetpack straps and glued them to the cardboard scrap as well. Last, I made the flames. I knew my kids were going to want to play with this after Halloween, so I wanted something more durable than tissue paper. Luckily I found some leftover red fleece and orange felt from previous years' costumes (Mario and parrot, to be exact). 1. 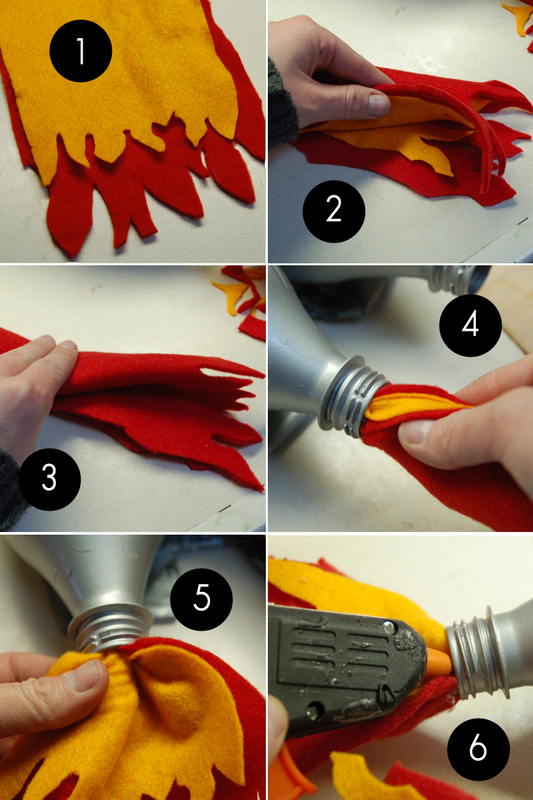 Cut out flame-y shapes on two contrasting fabric scraps if you have the skills, or just cut weird shapes if you lack artistic ability like me. 2. Stack pieces with smaller flame on top and fold in half. 3. 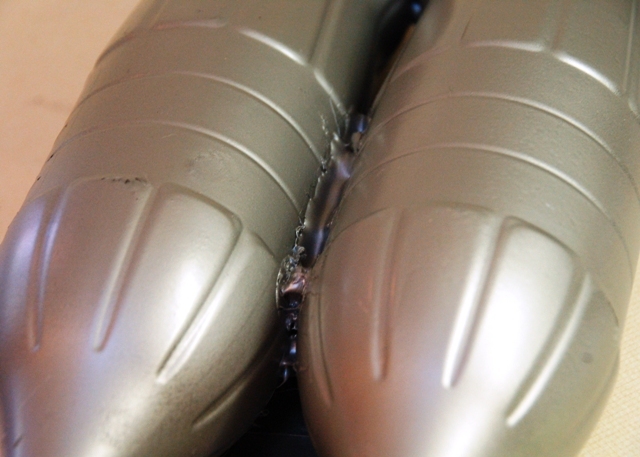 Fold in half again. 4. Insert fabric roll into the soda bottle opening and twist upward until your desired flame length is reached. 5. Fan visible flame out to expose the smaller accent flame fabric..
6. Stick a glue gun in it and call it done. Yep, I think he likes it. Holy quick, easy costume idea, Batman! FABULOUS!!! 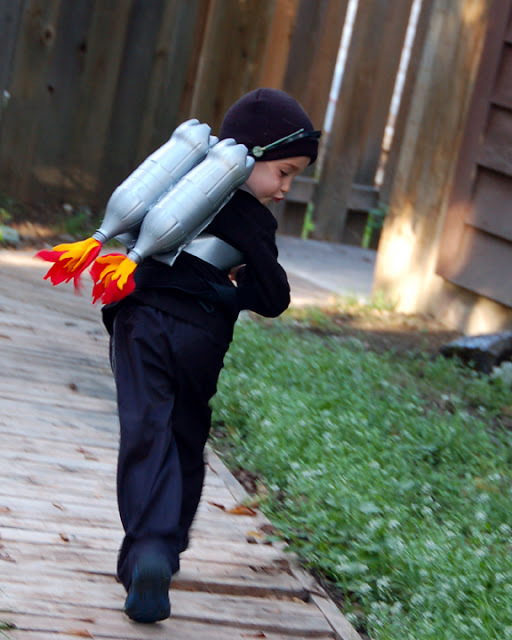 And what a super jet pack! I wonder if Wesley would let Grammy zoom around with that when she visits, hmmmm? I saw your jet pack on Pinterest the other day. Brilliant! 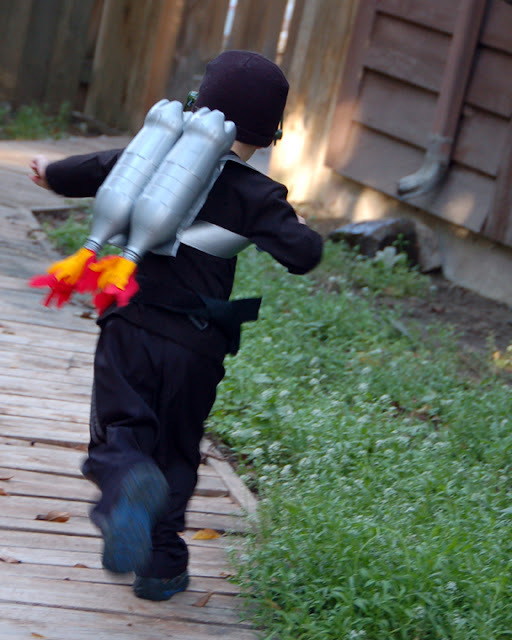 Oh my, I really need to make jet packs for my boys now! They'll love it!